It’s everywhere: on our networks, in our pockets, plugged into our ears and our TVs. We can’t escape the proliferation of socially collaborative technologies, wherever we try to hide. It draws us into communities around our favourite reality TV show, it permeates our choices of which books to buy and what device to read or listen to them on, it lets us run projects worldwide and, if we are very lucky, it helps us to make sense of the world around us. We need the right mindset around the technology: it’s about experience, curation, sharing and the co-creation of meaning. The Social Age is founded upon social technology for collaboration and we are just at the start of recognising the potential that it will bring. When i wrote about Mobile Learning last year, i called the book ‘Mindset for mobile learning‘, because it’s not about the technology per se, it’s about what we do with it, how we craft more effective and dynamic learning experiences through that technology. Which chipset it contains may facilitate that capability, but it’s not the direct cause. It’s the same with social collaboration, as many organisations know to their cost: you can invest all you like in systems that have ‘social‘ in the title, but if they’re not truly collaborative technologies, they won’t build a community and they won’t help us to create meaning. 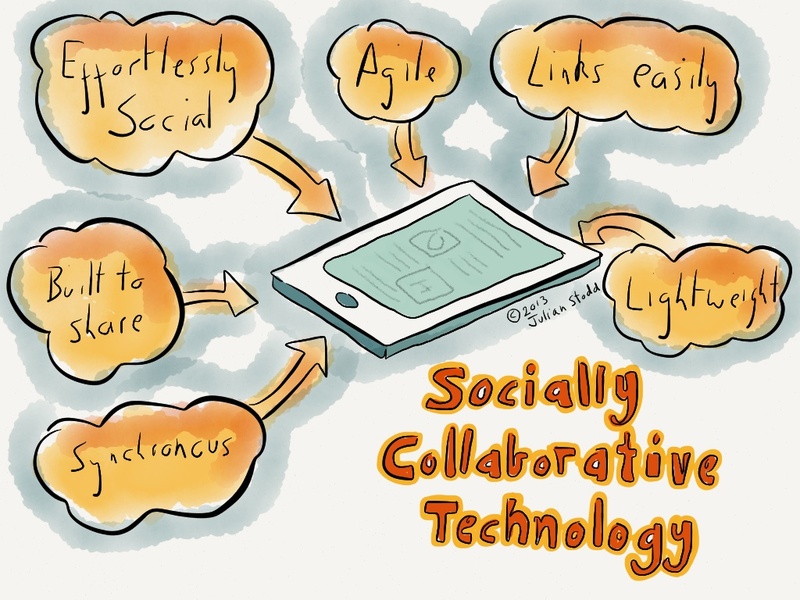 Truly social collaboration technology makes it effortless for us to engage, to curate and to share. Like Facebook. It’s virtually synchronous, which makes our encounters more conversational, more about storytelling than about publication. True social tech is agile and links easily: it doesn’t tie you in with licence agreements, platform specific functionality and endless login and registration pages. Truly social technology is about experience, not IT skills. The dinosaurs are dead: i believe that the time of those large, legacy systems that cost a fortune to install and never really did what you expected are gone. The future is about smaller, more interconnected technology that fits the social model: it talks to other systems, generates meaningful analytics and lets you act upon them easily. It adapts to context and location. We were out walking yesterday, a group of friends from University, and the subject came onto books: but instead of which books we were reading, we were talking about the ways we consume the content. Kindles, Kobos and iPads, even audiobooks. There was a constant theme: none of us had the answer. We are all experimenting, finding our way. There is no one system that is going to deliver all the functionality and features that you need to support social learning and social leadership. There may well be one mindset though: a mindset for curation, sharing and collaboration. Mindsets persist whilst technology goes through an endless cycle of development and updates. Get your mindset right and the rest will fall into place: it’s all about collaboration and finding technology that facilitates it. This entry was posted in Agile, Collaboration, Community, Experience, Learning, Learning Technology, M-Learning, Mobile Learning, Social Learning, Technology and tagged Collaboration, collaborative technologies, MLearning, Mobile, Mobile Learning, social collaboration, Social Technology, Socially Collaborative Technology, SoTech, Technology. Bookmark the permalink.